The Skeptic's Field Guide: Spooked911 Moon landing faked! Inspired by the ingenious experimentation of Spooked911, I decided to test the theory that the moon landings actually happened. The following is a draft paper I intend to submit to Science. Comments on my methodology are welcome. Are collisions between two bodies moving in space realistic, given one has been launched off a third moving body? A dynamic model of the Earth/Moon System and the Apollo Missions. The Apollo moon landing hoax accusations are a series of claims alleging that the Apollo Moon Landings never took place, but were instead faked by NASA. Nearly all interested scientists, technicians and space enthusiasts who have commented on the accusations have rejected them as baseless. Public opinion polls in the United States have shown that a large majority accept the Apollo missions as fact, while a notable percentage have at least some doubts about them. If it is possible for a Rocket to make it all the way to the Moon, land, and then return to the Earth, it should be quite simple to show this in an experiment-- right? 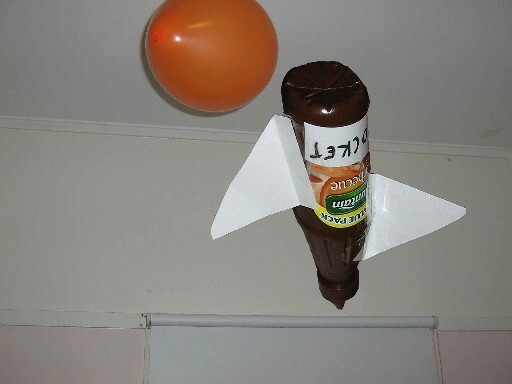 That a model rocket (barbecue sauce bottle with paper wings), launched from a model Earth (basket ball), will be able to make contact with a model Moon (a balloon) moving through 3 dimensional space. 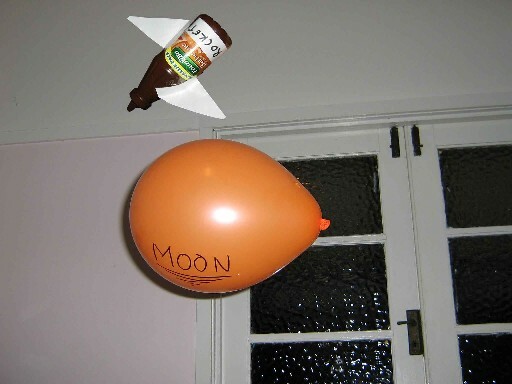 In order to test the hypothesis, that it’s even possible to land a craft on a falling object (the moon is technically free falling, but the curvature of its fall it the same as the curvature of the Earth) I conducted the following experiment. 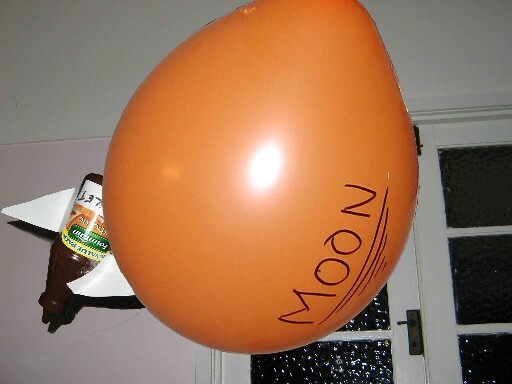 1: Note the "Moon" was a balloon dropped from a height, thus accurately modelling a free falling body in space. There was a minor complication with the installation of the “Rocket” wings. One was put on backwards (see pictures). However, it was assumed the effect of this error would be negligible. 2: The “Rocket” was placed in launch position on the “Earth”, and the “Moon” held at a height above the ground. 5:This procedure was repeated ten times for accuracy. As can be seen from the photographs, all “landing” attempts were unsuccessful. As was stated in the method, this procedure was repeated to ensure reliability. The hypothesis was that a model rocket (barbecue sauce bottle with paper wings), launched from a model Earth (basket ball), will be able to make contact with a model moon (a balloon) moving through 3 dimensional space. This hypothesis has been falsified in every attempted landing. Therefore it is unreasonable to assume that such a collision is realistically possible. However, there is potential for further investigation. For example, real rockets make a “roaring” noise on takeoff and someone at NASA does a countdown. This was not undertaken in this investigation. Next time I’ll say: “5, 4, 3, 2, 1, Liftoff!” and then make a roaring noise when I throw the Rocket into the air. Given this model represents a much simpler system that the actual Earth/Moon system, and the hypothesis has been falsified, the claim that people have actually ever been to the moon seems somewhat suspect and further investigation is required. Update 2 - I've now put the photos in an Image Shack slide show. Looks good.